Just as expected, T-Mobile has placed a number of new smartphones and a tablet up for sale today, November 2nd. While some of these devices have been available via Wal-Mart for the past few days, today marks the first official day you can grab them from all of T-Mobile’s retail channels. So what’s available beginning today? So if you’ve been eye-balling any of these brand new devices for the holiday season, now is the time to act! 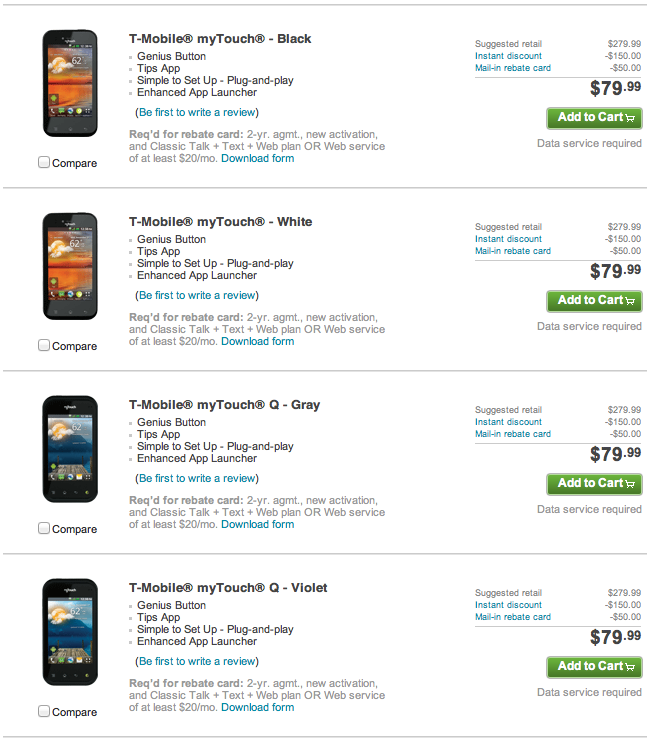 Purchase them all from T-Mobile. I’m confused, is this another myTouch 4G? Stupid Tmobile, instead of releasing good phones like Verizon, they got dumb ones like these. Where the hell is nexus, galaxy note, etc….??? no, its a Lesser LG made myTouch that’s nowhere near the quality of the recent htc myTouch phones. I have used the new LG phones, they are NOT as good of a build as the HTC devices. they are nice and they will work for people looking for feature rich phones at a good price. The Amaze, MT4G slide and the SGSII are the nicer feeling and better phones in terms of performance. Anyone know how the Q is vs the O-Slider? no myTouch and mytouch Q at our store today…. we have “coming soon” posted on them. — the q is not very impressive at all, even for an entry level android. feels and looks cheap.i’m assuming the non-slide version will be the same. but we have yet to receive one. the doubleplay is bulky, slow and ugly with poor screen quality just like the LG mytouch’s. the Radar is a nice little device and is the best phone coming out today. screen size is a bit disappointing but outside of that its a cool phone. the Exhibit II is not the best looking phone but is a solid little device with fantastic screen quality for an entry level device. the front of the phone is nice looking but the back is kind of ugly (nothing a case can’t fix though). the Galaxy Tab 10.1 is beautiful. enough said. Exhibit II at Walmart for $200 as a prepaid kit or non-qwerty MT for $279 off contract? So far the Exhibit II has gotten good reviews from users. But the MT has a better camera, better screen (though users say the Exhibit’s screen is pretty nice), and better battery life. I know LG’s rep has taken a hit w/ the G2X but the Optimus was solid. I just noted you quoted T-Mobiles Suggested Retail Price as it’s off contract price. Since you can’t get it off contract through T-Mobile’s website then it becomes a little harder to figure out what full retail price is going to be. Maybe you can get that price if your upgrading on a contracted line but not the 4g pre paid plan. It could cost less it could cost more. It all depends on the resellers. Won’t be upgrading, I’m giving my 3 month old Astound to someone. I’d be paying full price for the MT which I’m assuming is $279 in TMo retail stores. If I go with the Exhibit II it’ll be at Walmart for $200 and not $329 at the TMo store. Should add I’m on a post paid plan. I’d buy the prepaid kit for the Exhibit II but just popping in my sim. The Tab is coming up in search results, but not the product pages. Just an error, or not actually on sale yet? I wish T-Mobile had more Windows phones.. The 2 myTouch phones by LG are not available in stores yet! I work for T-Mobile. We have them in stock but we can not sell them until either the 7th or the 9th… We have the dummy phones on display with coming soon tags on them. Have you had a chance to test them out? if you have, what are your impressions? How do they compare to the Exhibit 4G II? The newest mytouch phones by LG are in a way a draw back from the last one. You would have thought LG would have tried to improve upon the HTC mytouch phones of the past. If this is Tmobiles doing did they forget they had a mytouch line going on? Maybe they are trying to kill it off or perhaps LG will be the standard of the mytouch brand and they want to start off with minimal specs so they can improve upon down the line. Who knows… but what I know is unless your new to Android… this phone isn’t worth getting. Especially since there are better choices. My touch is moving to the entry level position to make room for SGS2 and Amaze 4G as flagship phones, And more to come… May not be worth getting for a high end tech user but they are great phones for kids, seniors and people who just want a good phone that will get them on the web. Not everyone needs a superphone. anyone with the radar yet? I’m thinking of getting rid of my buggy MT4G and replacing it with a radar. any thoughts? I think I would prefer the Nokia 710 over the Radar, but it is another two months to get it. I would prefer T-Mobile had more to offer on the WP7 front. After the HD7 I thouht they would be a great fit for a variant of the Titan. It is too bad they seem to be going decidedly low end. Not available online for postcard customers yet… but it is for prepaid customers..
http://prepaid-phones.t-mobile.com/prepaid-phone/Samsung-Exhibit%E2%84%A2-II-4G-Prepaid Exhibit II 4g finally listed on pre-paid site. Price is $249 though. Lets hope they drop it to $199 soon or that Wal-Mart doesn’t up the price next week. I don’t get who “we” is but Amazon posted it today and they have it for $200 as well without a new number or anything.